The present release is the second of three which will bring together the 122 78 rpm sides of extended excerpts from Wagner’s tetralogy which His Master’s Voice recorded in London, Berlin and Vienna between 1926 and 1932. The scope of this project centers around the Ring albums – not every disc of music from the Ring which HMV issued during this period. The first volume (PACO107) gathered together excerpts from Das Rheingold and Die Walküre; the present set focuses on Melchior’s Siegfried recordings; and the final one will feature scenes from Götterdämmerung, as well as an appendix featuring alternate recordings from the series and an outline of motives from the Ring cycle. Melchior’s absence from these sides can be explained by the fact that he did not make his first recordings for the HMV labels until June, 1928. In May of the following year, sessions were scheduled in London for him to record Siegfried selections under Albert Coates, including re-recordings of material already covered in Laubenthal’s solo sides. These were collected into a second, five disc volume on HMV. Further recordings in May, 1930 (“Selige Öde” and “Das ist kein Mann”) under Robert Heger were issued on two single discs. In America, Victor collected these, the 1929 recordings and the unduplicated 1927-28 Siegfried sides from the first volume in a ten-disc set. Further recordings of excerpts from Acts 1 and 2 in May, 1931 and the Act 3 duet in May, 1932, all under Heger, were issued as separate volumes both in Europe and America. Ultimately, HMV released a 19-disc set of the 37 sides presented here, although it was never offered this way on Victor. Fortunately for posterity, Melchior’s unsurpassed assumption of the rôle was captured nearly complete at the height of his considerable powers in these recordings. The sources for the transfers were multiple copies of American Victor editions: prewar “Z” and “Gold” label pressings, as well as a particularly quiet postwar album, for the 1928-30 recordings; “Z” and “Gold” editions for the 1931 recordings; and two sets of “Z” pressings for the 1932 final scene. The progress of electrical recording during this period can be traced through the variable sound of the originals, from the dim Vienna sides of 1928 and the occasionally strident and overloaded London sessions of 1929, to the warm, detailed sound obtained in Abbey Road in 1932. 3 Hoiho! Hoiho! Hau ein! Hau ein! 7 Heil dir, weiser Schmied! Heinrich Tessmer, ten. ; Lauritz Melchior, ten. ; Friedrich Schorr, bar. 10 Nothung! Nothung! Neidliches Schwert! Albert Reiss, ten. ; Lauritz Melchior, ten. 14 Deine Hand hieltest du vom Hort? Eduard Habich, bar. ; Friedrich Schorr, bar. 1 Da lieg auch du, dunkler Wurm! 2 Gönntest du mir wohl ein gut Gesell? 3 Hei! Siegfried erschlug nun den schlimmen Zwerg! Lauritz Melchior, ten. ; Nora Gruhn, sop. Emil Schipper, bar. ; Maria Olszewska, con. Rudolf Bockelmann, bar. ; Lauritz Melchior, ten. 11 Selige Öde auf sonniger Höh’! 12 Das ist kein Mann! 17 Ob jetzt ich dein? Florence Easton, sop. ; Lauritz Melchior, ten. There is no consistency here of orchestras, conductors or singers - except that Melchior is the Siegfried throughout, and what a Siegfried! I am well aware of his sometimes faulty sense of rhythm and vagueness over note values, but what are these set against his unsurpassed fullness of tone, his ability to convey the part’s many moods (in particular its youthful ardour) and his peculiar vividness of articulation? All prospective Siegfrieds should be locked up with his Sword and Forging songs (‘Nothung’ and ‘Schmiede, mein Hammer’) until they can manage them both with Melchior’s control and perception. He is just as exemplary in the peace of the Forest Murmurs, and the worry and sadness of ‘Selige Öde’, once available separately on the HMV German list as EJ 485, almost my first acquaintance with the singer along with ‘Nothung’ from this set (backed by a matchless Prize Song, DB 1858). The rest of the cast, all from Covent Garden, is more variable. Heinrich Tessmer’s truly sung Mime turns into Albert Reiss’s caricature by the end of Act 1. Eduard Habich is a menacing Alberich. Schorr’s Wanderer, subtle and often poetic in Act 1, is succeeded by Bockelmann’s more prosaic but not inconsiderable portrayal in Act 3 (Schipper is, of course, heard in Act 2). Nora Gruhn holds up British interests with a perky Woodbird. Florence Easton, London’s 1932 Brünnhilde and one of New York’s regular interpreters of the role from 1924, presents a human, vulnerable goddess (a contradiction in terms I know). Her bell-like tone and superfine diction, much admired at the Metropolitan, are much in evidence here. Heger and Coates, both expert Wagnerians, share the conducting. I first encountered this recording in the shape of a substantial box of 78s (19 discs in all) belonging to Claire Campbell, to which I and a number of friends listened rapturously in her rooms at Somerville College in Oxford in 1970 or 1971. We were enraptured chiefly by the sound of the voice of Lauritz Melchior, so self-evidently made to sing the role of Siegfried and producing heroic tones which far surpassed the assumption of the role by Wolfgang Windgassen for the Solti Ring with which we were familiar. At the same time we were disappointed by the severely scrawny sound of the recording, and even more by the barbarous butchery inflicted on the score by the need to cram the extracts from the opera onto the lengths of 78 sides. I had not heard the recording since then, and although Pristine have done wonders with the sound in this re-mastering there is nothing they can do about the swingeing cuts which remove around half the score. Mark Obert-Thorn in his booklet note claims that “Melchior’s unsurpassed assumption of the role was captured nearly complete at the height of his considerable powers in these recordings”. In fact there is nearly a third of even his part missing (at a guess) including the whole of his two encounters with Mime in Act Two and the greater part of his confrontation with the Wanderer in Act Three, as well as more minor cuts elsewhere. Nevertheless we do have the most salient parts of his assumption of the part here, in a series of studio recordings that inevitably have more vocal presence than the stage transcriptions made ten or more years later which have appeared on CD over the years. Melchior was frequently criticised for his slack sense of rhythm and careless disregard for note values, but it must be observed that at this early stage of his career these faults are nowhere in evidence. He even manages a creditable top C on his entrance in Act One, which is more than can be said for many Siegfrieds even today. 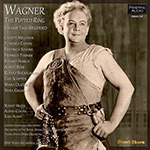 The hammer-strokes in the forging scene are spot-on, which if Melchior is actually hammering himself is remarkable; but I suspect that the job is delegated to a percussionist, although John Culshaw seems to think that this ‘trick’ was not employed until the Decca recording the Ring under Keilberth at Bayreuth in the 1950s. Mime’s hammering at the opening of the Act, however, sounds quite different in tone — more like a wood block than an anvil — and since there are errors here one suspects that the effects were recorded live by Heinrich Tessmer. This is one of the few slips in his performance, steady and firmly voiced. This is more than can be said for Albert Reiss who takes over the role in the later sections of the Act, with a feeble tone which is afflicted by a wobble on sustained notes and frequently departs from the notated pitch altogether. That, coupled with the fact that the forging scene is recorded with less immediate impact — it is surprising how much electric recording techniques improved in a short period — leaves an impression that is unfortunately less than ideal even though Melchior is thrilling. On the other hand we do have Tessmer in the first half of his scene with the Wanderer. Here Friedrich Schorr is firm and trenchant even if some later interpreters have sounded more noble and less tetchy. There is a short cut in the scene, of the passage where he challenges Mime to their duel of wits. Schorr returns again for the opening of Act Two and his scene with Alberich, which is disappointingly shorn of its atmospheric Prelude. The dispute itself is barbarously abridged, which robs both protagonists of any chance to build up atmosphere, with even the closing bars of the scene brutally hacked off. Eduard Habich is a characterful Alberich, but it was definitely a mistake to ask him to double the bass role of Fafner; quite apart from the dramatic nonsense when he immediately responds to his own questioning, his voice is quite unsuitable and totally lacks any sense of distance; this dragon in his cave is clearly standing shoulder to shoulder in front of the microphone with the other characters. Habich also takes on the role of Fafner in his (heavily abridged) fight with Siegfried, and here his lack of the requisite bottom notes is simply embarrassing. Melchior is properly tender in the forest murmurs, but even his horn-call is reduced to a single phrase and it is in passages like this that the phrase “potted” rears its head in entirely the wrong sense. The best section of this Act is the short duet between the two Nibelung brothers, where Habich and Tessmer build up quite a head of steam. In the final scene of the Act (somewhat trimmed) Nora Gruhn is a rhythmically free Woodbird, but Melchior is again superb with a real sense of loss as he sings of his loneliness after the deaths of everyone he has cherished in his life. The first scene of Act Three is given absolutely complete — if with a rather abruptly cut off ending — but it is probably the least satisfactory rendition of this set, as well as the worst recorded. The orchestral playing under Karl Alwin is horribly imprecise, and the singing of the husband-and-wife team of Emil Schipper and Maria Olszewska is nothing special. He petulantly resorts to shouting in places, and she strains ineffectually for desperately thin high notes as she tears into Wotan’s treachery. Rudolf Bockelmann is considerably better, although clearly no Schorr, at the end of his scene with Siegfried. This is ruined by the extraordinarily fast speed adopted by Coates which leaves both singers flailing to keep up. It is hard here to understand the high reputation that Coates enjoyed as a Wagnerian conductor, except perhaps to attribute it to the chauvinism of British critics at the time. In the following interlude there is a sudden cramming on of the brakes at the climax, which has no warrant whatsoever in the score. Heger is far more effective in the scene on the mountain top, again slightly cut but at a far more reasonable speed. Florence Easton sounds rather matronly at the beginning of the long duet, but by the end she finds a more appropriate tone and she and Melchior are well matched. This set is of course no match for more modern recordings of Siegfried, and could hardly be regarded as a sole representation of the opera for a collection but it stands as an ‘Old Testament’ of Ring recordings. In this sense it illustrates both the very best and sometimes the worst of Wagnerian singing in the inter-War period. Mark Obert-Thorn has done wonders with the sound, reducing background noise to an almost undetectable silence which pays real dividends, for example, in the long passage for unaccompanied violins as Siegfried arrives on the mountain top. It certainly knocks spots off the scratching of the original 78s as I recall them from my first acquaintance. It is a pity that fuller details of the recordings themselves and the artists could not have been provided in a more substantial booklet, but as usual with Pristine there are plentiful notes available on their website including a review of the original 78 set by Alan Blyth drawn from his Opera on Record. There were also recordings of the forging scene and the final duet (cut) made at the same time as the Schipper/Olszewska duet featuring Horst Laubenthal and Frida Leider as Siegfried and Brünnhilde. We are advised that these excerpts will be included as an appendix to Volume Three of Pristine’s Potted Ring.